These are settings that you have the ability to enable or disable. They’re found in your course Settings, under Grading, and affect how your students get graded for their work in your alta course. ...Mastery percentage on assignments will pass to your LMS and CSV export, but if a student later completes an assignment after the due date they can still get 100%. Quiz and test scores will still record as usual at the time of completion. At the due date, scores for a quiz or test, as well as a 0 or 1 for assignments, will pass back to your LMS or CSV. No credit will be given on work done afterward. Students can continue to work after the due date, but a new grade will not be reflected in the gradebook. ...Students’ mastery percentage will record at the due date and time. Quizzes and tests will be auto-submitted, and students can continue working on assignments but no credit or score will be recorded or updated after the due date. Note: If you change your grading policies after the beginning of the course and after student grades have already been recorded, any grade changes will be applied retroactively. 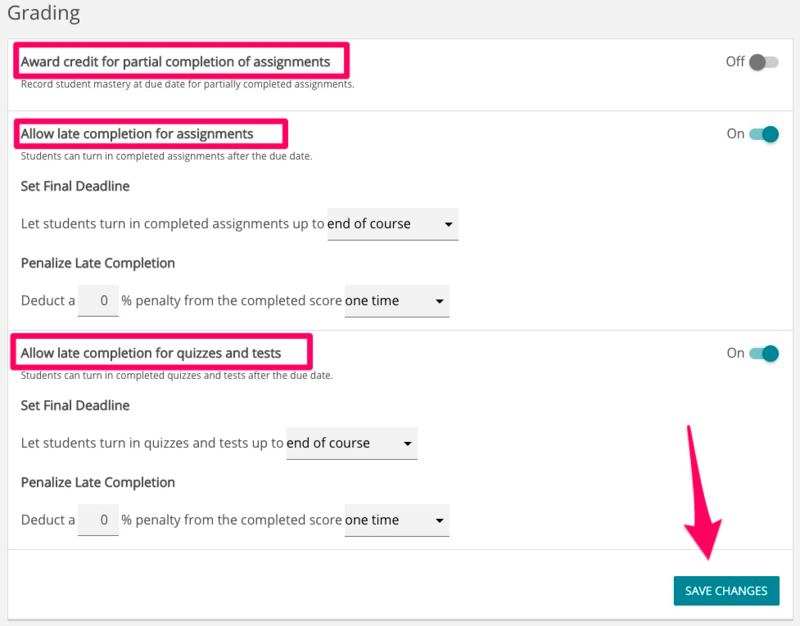 For example, if you decide to enable late completion when it was previously disabled, grades will be updated for any students who worked after the due date and had grades that were previously not calculated. Using a Learning Management System? Learn more here!